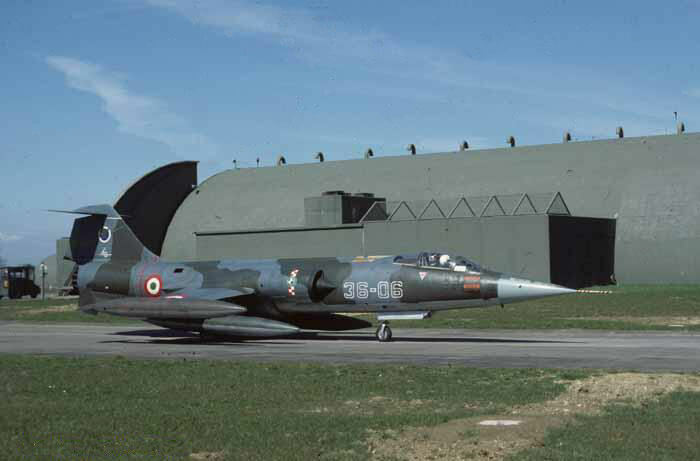 This month Italian Air Force 12 Gruppo based at Gioia del Colle AB, flying the F-104S exchanged with Royal Air Force 56 Squadron at Wattisham AB and flying the Phantom FGR.2. 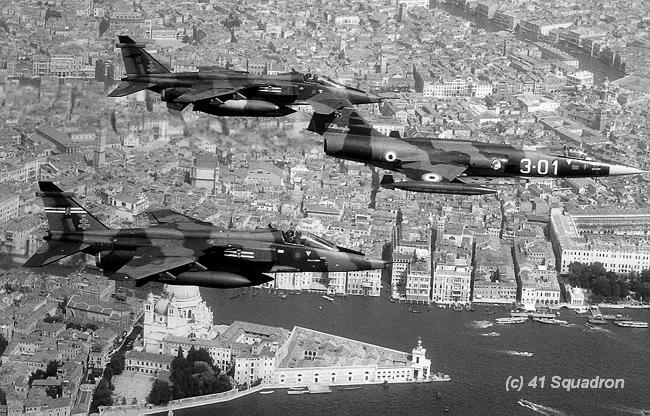 It is unknown if it was a 1 or 2 way squadron exchange but at least four Italian Starfighters flew to the UK being: MM6822/36-01, MM6776/36-06, MM6942/36-10 and MM6875/36-22. All departed the 15th of April while the 36-01 departed on the 18th. 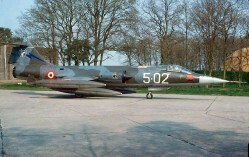 A few weeks before, on 12 March 2006, two Starfighters made a pre-visit to Wattisham being MM6942/36-10 and MM6818/36-14. Two G-222 aircraft have been seen at Wattisham during the squadron exchange as well. The aircraft, MM62116/46-35 and MM62133/46-93 were seen on the 9th of April. 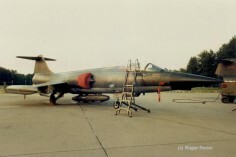 The Starfighters received nice 56 Squadron decoration on their inlets as shown on the photo beneath of MM6776 code 36-06 taxying at Wattisham. In April 1985 the Rimini based 102 Gruppo, flying the F-104S exchanged with the Royal Air Force 20 Squadron at Laarbruch flying the Tornado GR.1 jet . It was a two-way squadron exchange. 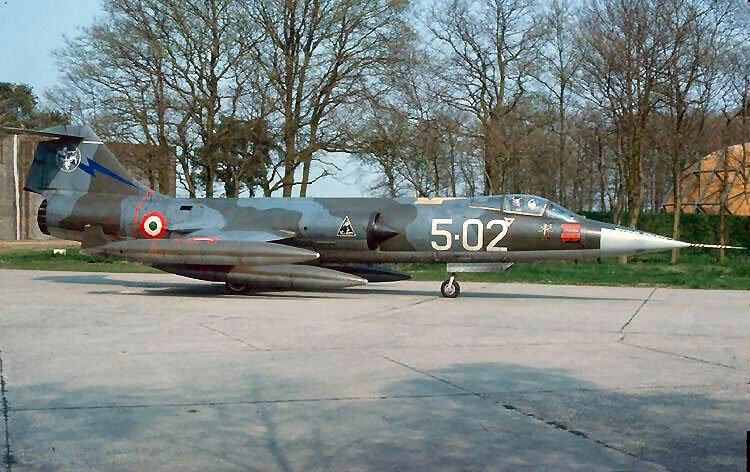 The four Italian aircraft which flew missions from Laarbruch were MM6921/5-02, MM6912/5-13, MM6789/5-15 and MM6787/5-24. 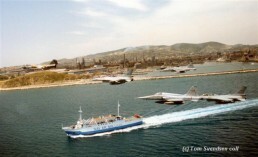 A number of week before, on 5 March 1985, two aircraft arrived for a pre-visit while staying the night. These were MM6913/5-03 and MM6914/5-21. Two G-222 aircraft were seen as well during the squadron exchange being MM62116/46-35 and MM62133/46-93. The latter one was seen on the 17th of April. 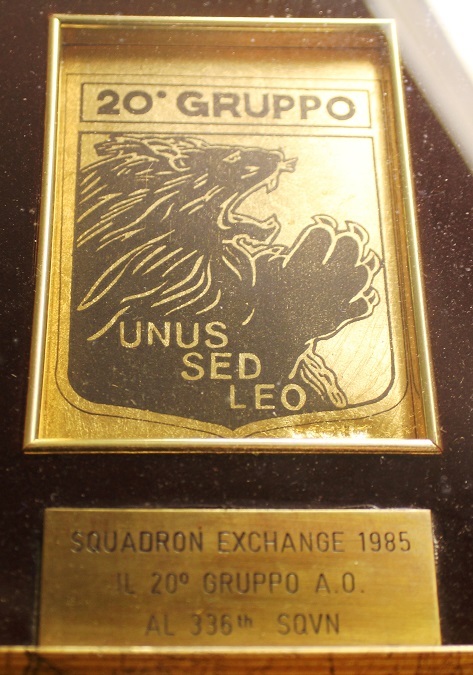 It is not exactly known when the squadron exchange ended. Beneath a photo taken by Eric Tammer on April 18th of MM6787 code 5-24 and another showing the taxying MM6921 code 5-02 at Laarbruch. 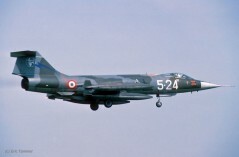 This month the Italian Air Force 28 Gruppo based at Villafranca AB, flying the F-104G exchanged with Hellenic Air Force 340 Mira flying the A-7H Corsair II aircraft at Souda. It was a 2 way squadron exchange. 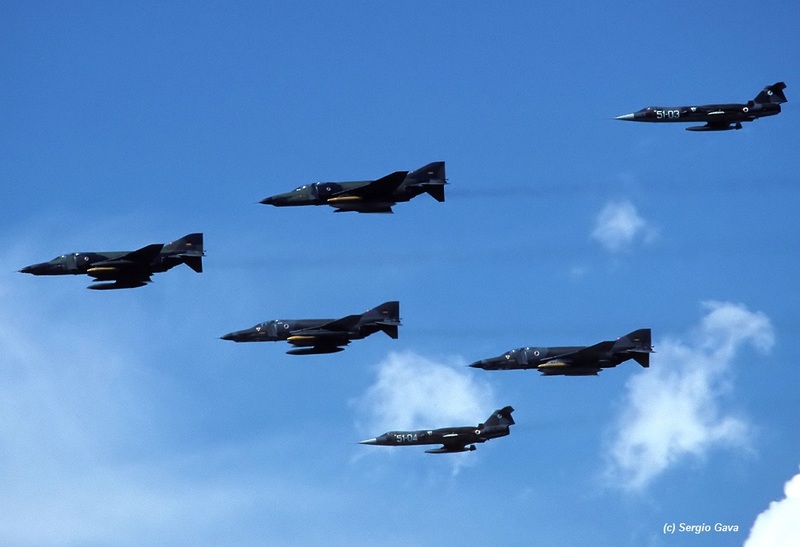 Starfighters present at Souda were MM6528/3-33, MM6589/3-34, MM6547/3-37 and MM6533/3-44. This month the Belgium Air Force 350 Squadron (1 Wing) based at Beauvechain AB, flying the F-16 exchanged with Turkish Air Force 142 Filo flying the F-104G at Murted AB. 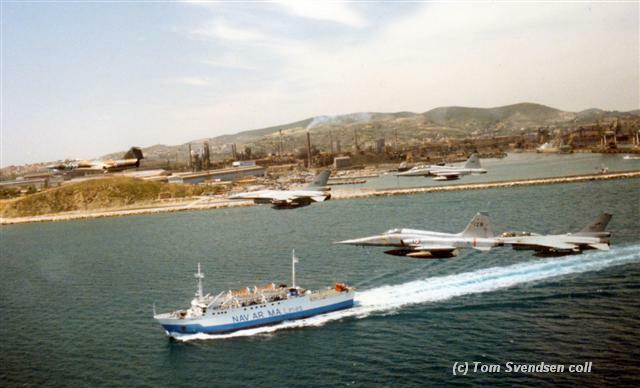 It was almost sure a 1 way squadron exchange were the Belgium F-16s were seen in Turkey. This period Canadian Armed Forces 421 Squadron (1 CAG) based at Baden-Sollingen, exchanged with Dutch Air Force 311 Squadron at Volkel AB flying the F-16. 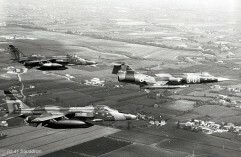 It was a shifted 2 way squadron exchange. The Canadians were at Volkel AB from May 28th till June 5th while five Dutch F-16s went to Sollingen from September 24th till October 3rd. 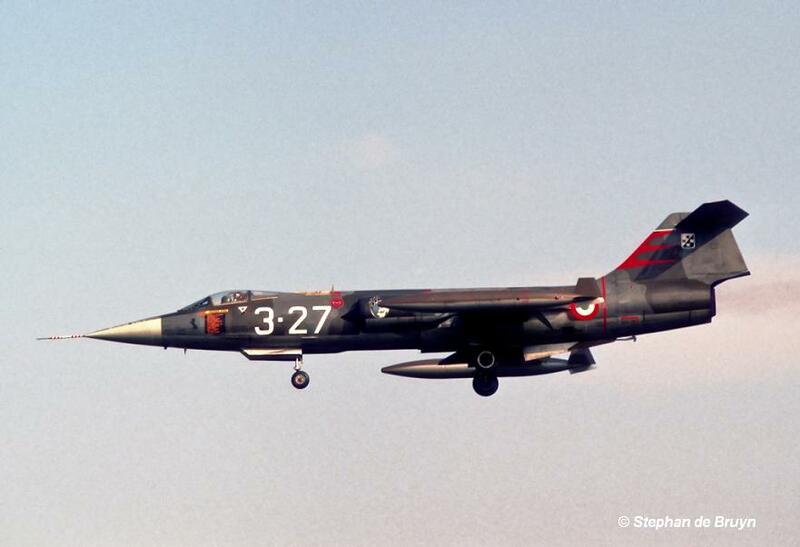 The Canadians participated with a lot of aircraft being CF-104s 104716, 104735 (arrived 3 June), 104739, 104747, 104756, 104773 (departed on 4 June), 104826 (arrived 3 June), 104862, 104873 and 104891. During the stay of all these CF-104s at Volkel there were a lot of Canadian visitors including some Hercules transport aircraft and a number of T-birds. 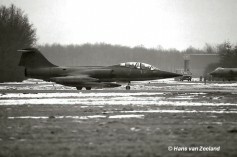 On Februari 21st three Starfighters (CF-104 104713 and 104862 together with CF-104D 104639) landed for a pre-visit and stayed the night. Since that period the area was celebrating Carnaval the Canadians must have had a nice evening. Another pre-exchange toke place on March 27th by CF-104 104810 for the final arrangements. Photos beneath show CF-104D 104639 during the pre-exchange on February 22nd before its departure from Volkel (Photo: Hans van Zeeland), Also two photos taken durng the exchange showing 104747 and 104776 both taken on June 4th by Roger Seroo. This month Italian Air Force 20 Gruppo based at Grosseto AB, flying the F-104 exchanged with Royal Norwegian Air Force 336 SKV at Rygge. It was a two way squadron exchange. 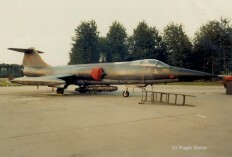 The Norwegians flew the F-5 but were exchanging to F-16's. At the time of the exchange 336 SKV was still equipped mixed with F-5A and F-16A, so both types really involved. Soon after the end of the exchange the plan to convert 336 SKV. to F-16 was changed and cancelled…so F-16 were given up and 336 SKV. stayed with the F-5. Photos beneath show a nice mixed formation over the coast of Italy. Beneath also the crest found by Tom Svendsen at Rygge, which was specially created for the exchange by the Italians. 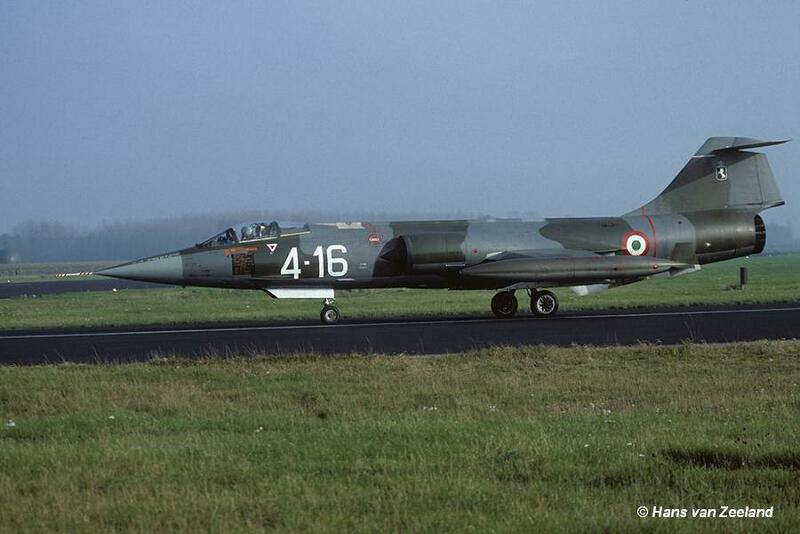 This month the Royal Danish Air Force 726 Eskadrille, based at Aalborg, flying the F-104G, exchanged with French Air Force EC 2/30, flying the Mirage F1C at Reims. 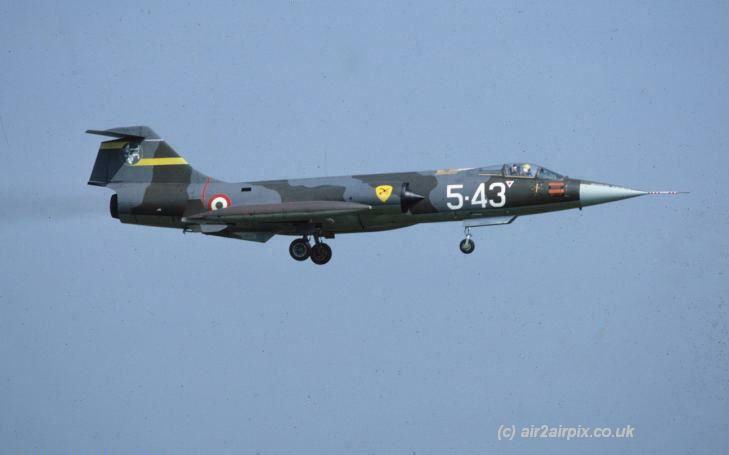 Aircraft R-342, R-646, R-702 and a fourth unidentified Starfighter were seen in France. It is unknown if it was a 1 or a 2 way squadron exchange. 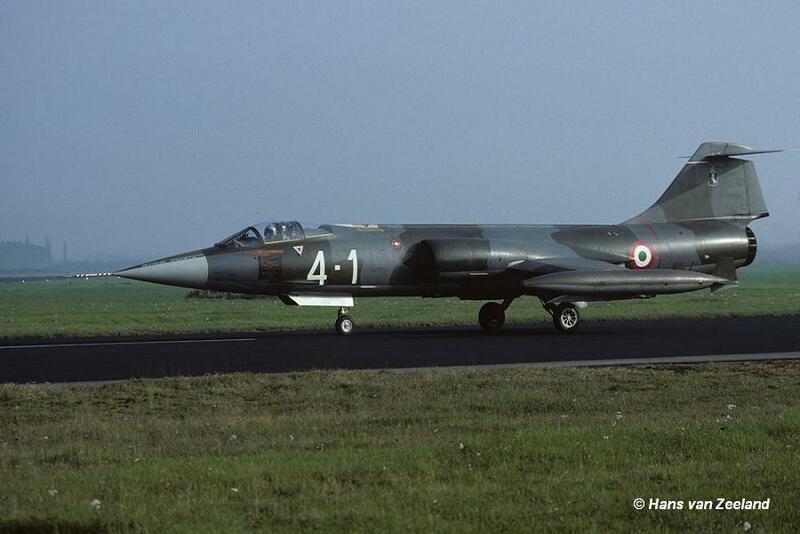 This month Italian Air Force 10 Gruppo based at Grazzanise AB, flying the F-104S exchanged with German Air Force JBG36 (2nd staffel) based at Hopsten AB, flying the F-4F. It was a 2 way squadron exchange. While the German Phantoms were in Italy, four Italian Starfighters operated from Hopsten. The four participating aircraft during the squadron exchange were: MM6936/9-31, MM6919/9-33, MM6932/9-41 and MM6817/9-45. 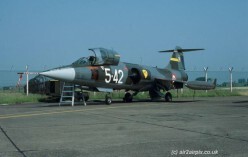 The pre-exchange took place on 14 and 15 May (including a nightstop) by aircraft MM6727/9-40 and MM6919/9-33. 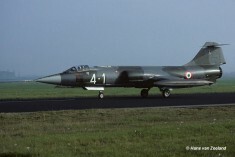 This month Italian Air Force 23 Gruppo based at Rimini AB, flying the F-104S exchanged with Royal Air Force 29 Squadron based at Coningsby, flying the Phantom FGR.2. It was a 2 way squadron exchange. 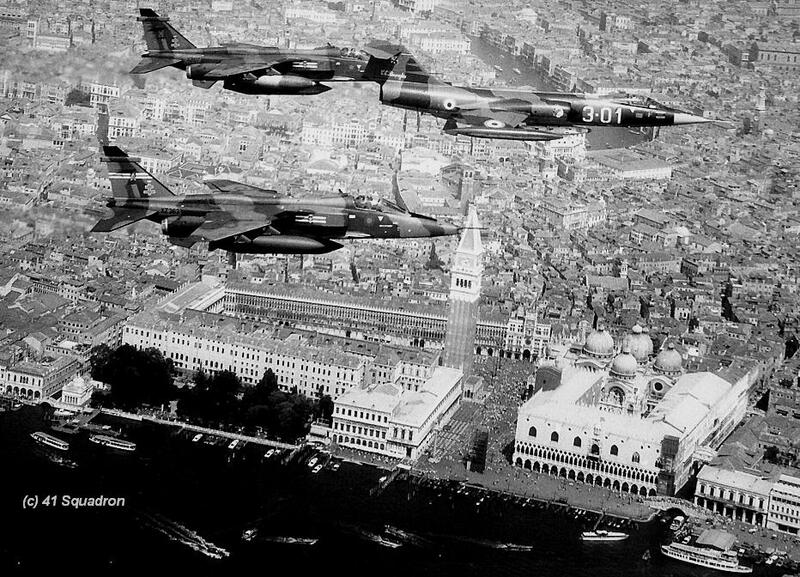 Four Italian aircraft came to the UK. Some months earlier, on 22 April, the MM6789/5-15 and MM6815/5-33 and TF-104G MM54257/20-22 made a pre-visit to Coningsby all flying via Laarbruch. It is very likely that during this pre-visit MM6742/5-20 stayed at Laarbruch due to a problem where MM6789/5-15 replaced him. 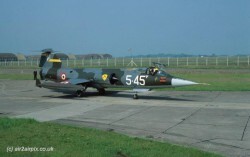 In total four Starfighters flew to Coningsby in July being MM6815/5-33, MM6814/5-42, MM6705/5-43 and MM6714/5-45. Aircraft MM6705 and MM6814 both participated at the Air Tattoo at Fairford on 12 and 13 June 1985 after leaving Coningsby. The other two aircraft flew back home directly. Beneath some photos which were sent to us. 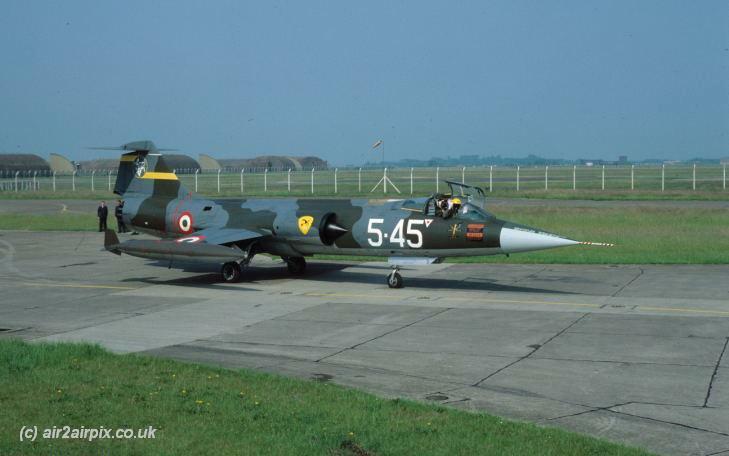 Four F-104S Starfighters from the Cameri based 21 Gruppo exchanged with the Royal Air Force 74 Squadron at Wattisham flying the F-4J (UK). 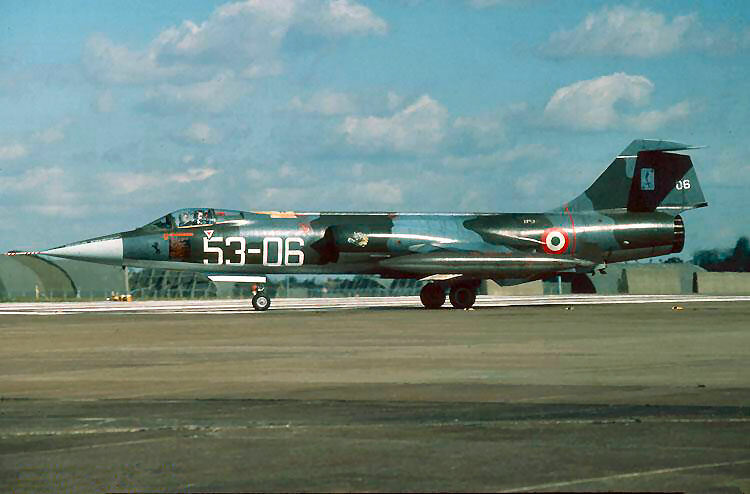 The participating Italian aircraft were MM6825/53-06, MM6806/53-14, MM6881/53-15 and MM6772/53-20. Transport was done by C-130K aircraft XV217 and XV307 on September 3th while on the 12th of September the C-130H MM61993/46-07 took care of the transport back home to Italy. It was a two way squadron exchange. Beneath a photo showing 53-06 taxying at Wattisham. Note the interesting horse zap on the nose section. This month the Canadian Armed Forces 441 Squadron (1CAG) based at Baden-Sollingen, exchanged with Royal Air Force 15 Squadron based at Laarbruch flying the Tornado aircraft. It was a shifted squadron exchange. The Tornados flew from Baden between 28 May and 7 June and the CF-104s flew from Laarbruch between 3 and 13 September with six aircraft. 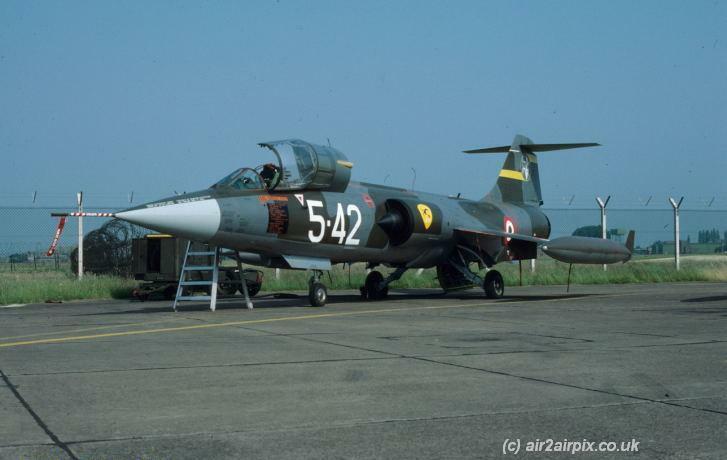 This month Italian Air Force 9 Gruppo based at Grosseto AB, flying the F-104S exchanged with Dutch Air Force 315 Squadron based at Twenthe AB. 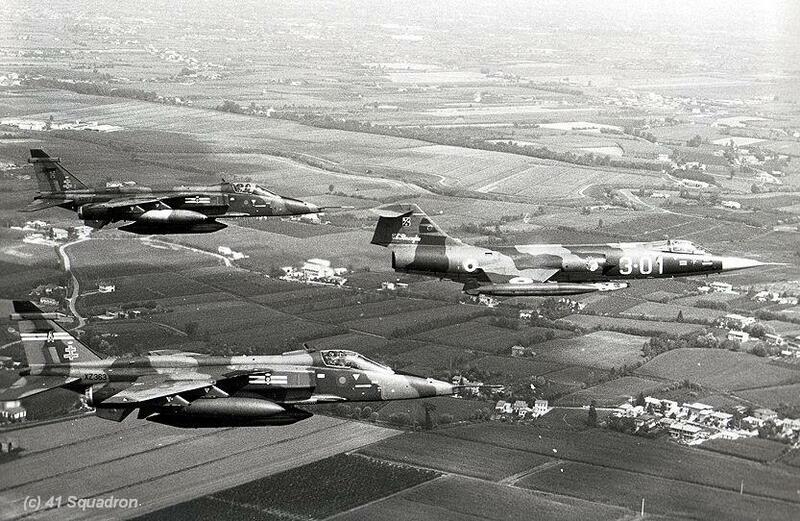 It was most likely a 2 way squadron exchange. At least the Italians came to Holland. On the 24th of September a pre-visit was organized by aircraft MM6706/4-1, MM6930/4-22 and MM5257/4-39. 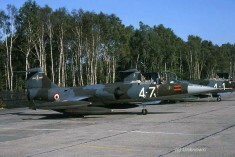 Participating aircraft during the squadron exchange itself were MM6706/4-1, MM6937/4-3, MM6778/4-7 and MM6769/4-16. Some believe that also MM6930/4-22 participated (a few days) but we have no confirmation. 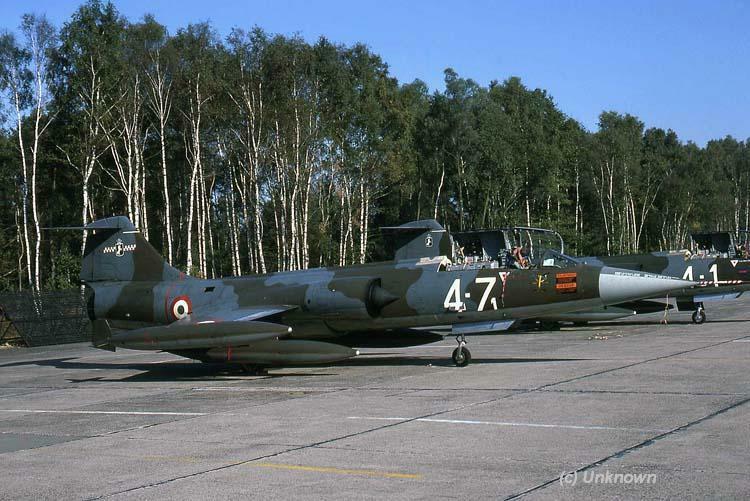 On 28 October two TF-104Gs made an overshoot, probably waving to the Grosseto based collegues… They were MM54230/4-27 and MM54254/4-36. Beneath some photos thanks to Hans van Zeeland.